It is by now common knowledge that cheap leather bags are made and sold in Dharavi. Export quality, the shopkeeper will tell you. As much as the thrifty buyers and the choosy entrepreneurs flock to the line of leather goods shops on the Sion-Bandra Link Road, people are repelled by the stench of leather curing workshops on 60 Feet Road. The air smells of brine, sulphur, decay and human negligence. As vehement as animal rights groups and brand empires are about saving innocent animals from the clutches of fashionistas, something must be said about the manner in which the lower income groups work in these units. 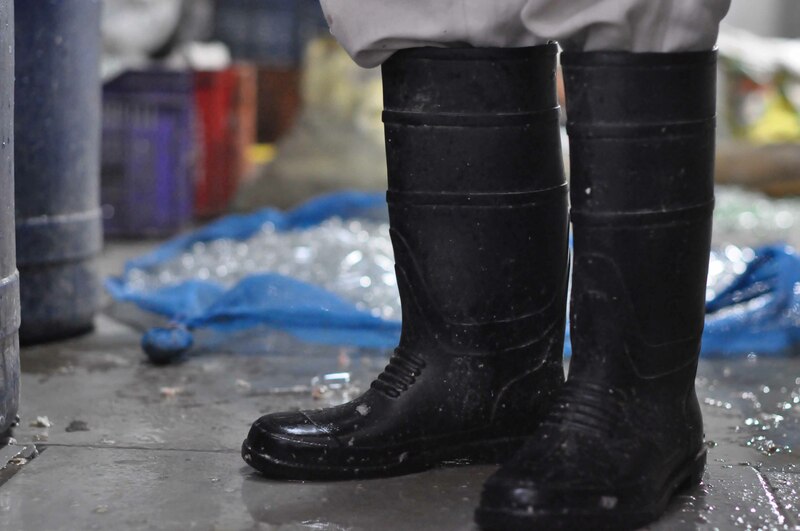 No rubber boots, no gloves, no masks, no legal interventions to protect them from the conditions they work in. 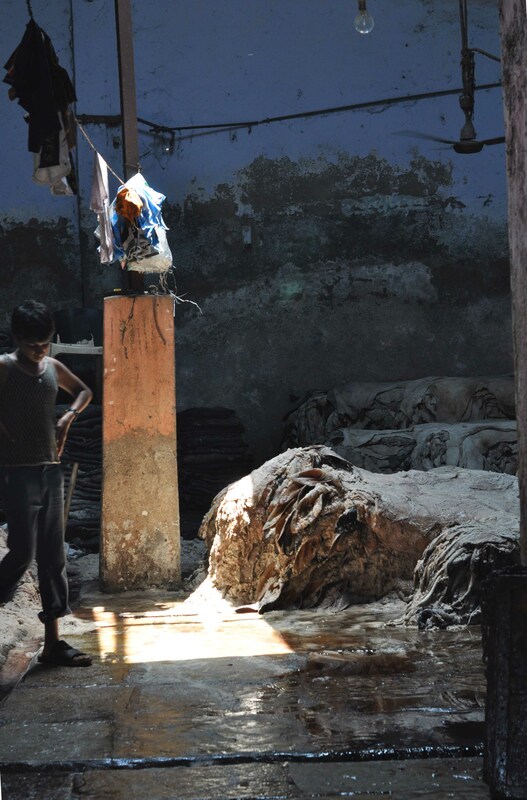 To stand outside a leather curing workshop in Dharavi is to remember the stench of pukish drunken nights. Meet these brazen curing labourers, and you know that it takes more than just alcohol or drugs to get you through a day. You are driven by a desperate need to survive. The conclusion is, however, not to close down the units. Especially not when the shutting down of a big manufacturer means the loss of jobs, however unorganized, for these daily wage earners. Especially not in a country which has a history of so called 'lower' castes and certain religious groups being the ones who fetch you your leather. The point is to investigate better working conditions that will provide improved health for these workers. At a recent workshop, some high school students from Dharavi were accompanied by Nitant Hirelakar to photograph some examples of occupational hazards in their localities and make a pixel art installation that highlights the dual nature of these Dharavi businesses. There is lots of money, there is little consideration for human value. However, this is not just a Dharavi thing. It is perhaps how many labourers are hired all across the country. Your body is a piece of equipment that keeps the machinery running. If the equipment is defective, you can always get another here. Labour is the cheaper than water. One of the sites that Nitant and his photography group visited was Prem Nagar, on the outskirts of Dharavi, near Kurla. 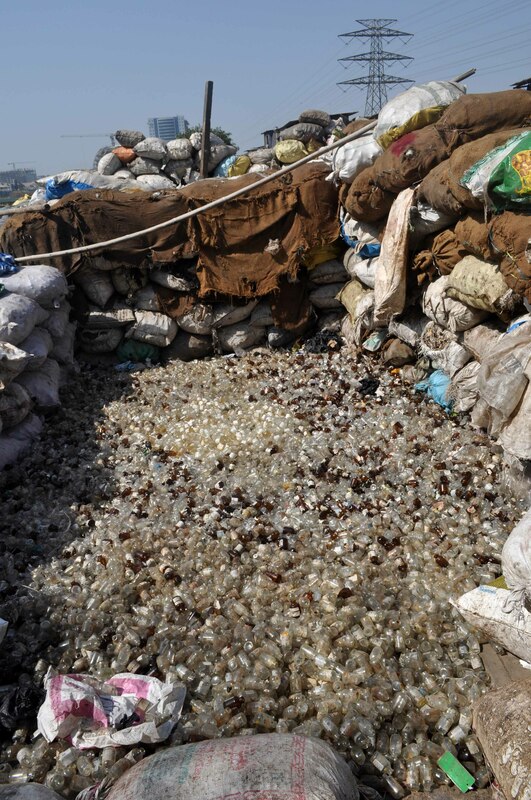 This is the mega-hub of glass recycling, where tons of surgical vials, ketchup bottles, jam containers and the likes are dumped here to be sorted, cleaned and re-sent to factories for fresh packaging. That which can’t be resent is turned into shards that shall be melted for renewed purposes. As the young photographers alternated between mesmerized and repulsed, the labourers and the middlemen at these tiny, dark workshops were bemused. A little wary of these photographers, even. Here again were the lack of basic protection for the cleaners and the sorters. On the banks of a little channel running from the guttery Mithi, a man sorted metal caps of soda beverages using a handy magnet. 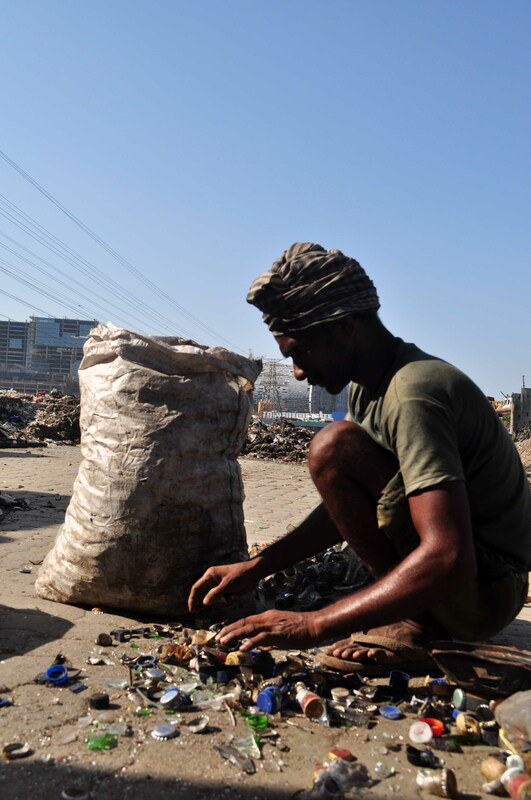 Hunched and focussed, here was a Gollum of present day Dharavi looking at his precious. Fumes, waste fluids and reminiscences of Katherine Boo’s depiction in Behind the Beautiful Forevers of young disadvantaged Indians inhaling Eraz-ex for their nightly high come to your mind. 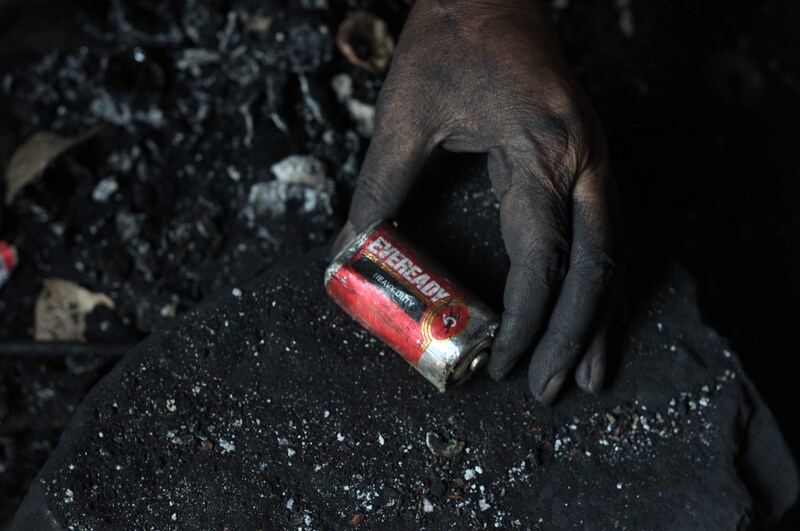 At one musty workshop were a group of men and women who specialised in the niche job of removing zinc from discarded batteries to be repurposed. They are covered in zinc powder, only their eyes are flashing. Again, no gloves, no masks and definitely no health check-ups either. The labourers themselves have nothing to complain about. As long as the job gets done. As long as there is yet another day with a job at hand. Life goes on. Occupational hazards, as mentioned before, are definitely not a Dharavi feature and not merely a symptom of the lower income groups. However, traffic policemen with varicose veins will get sick leave, IT professionals with slip discs can avail a mediclaim policy and teachers with laryngitis can consult school doctors. What will a daily wage earner do?